SUP' Adventures - a great way to train or a pleasure in itself? To celebrate the launch of some new operators on our website, we wanted to talk to you adventurers about some of our favourite places to SUP and its health benefits. Let's start with 3 quality destinations for your next SUP adventure. Riva Del Garda, which is the most Northern point on Italy's Lake Garda is naturally blessed. The entire area from the shoreline of the lake, back towards the mountains of the nearby towns of Arco and Nago, Riva is beautiful and full of extreme sports potential. Thanks to the Ora wind which kicks in like clockwork- daily at 1 pm (thanks to the unique local microclimate created by the peaks surrounding the lake), Riva has become a SUP lovers hotspot. No matter your ability you are guaranteed perfect paddle board conditions all morning! But once again to emphasise how insanely stunning the area is, its an absolute must visit. There are numerous clubs to hire equipment from dotted on the shore. Our recommendation is Pier Windsurf. 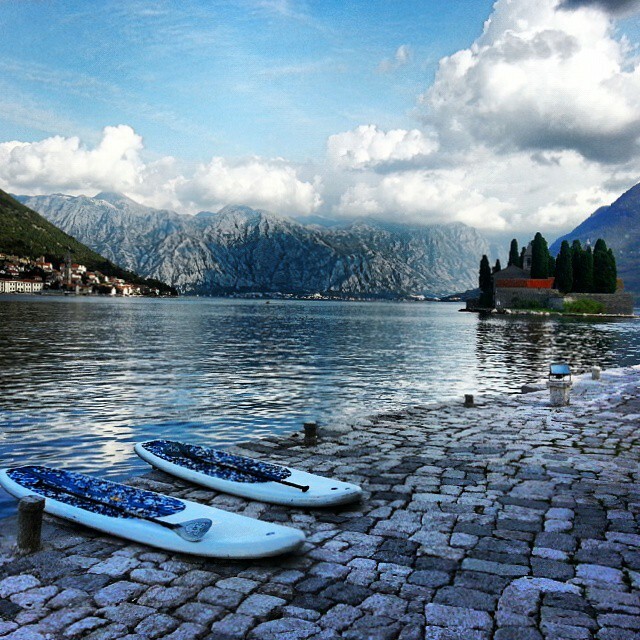 Explore the ancient and historical shores of Montenegro on your board. Paddle past old buildings that are reminiscent of Italy with a baltic twist which gliding over the cool clear waters. Exploring at its finest. Particularly in the summer as temperatures soar, SUP poses a wonderful break from meandering around the cobbled streets in the village. The waters are consistently calm which ensures all abilities are catered for. For more information on tours, click this link here. If you're not spending every waking minute surfing then SUP is the BEST alternative to pass the warm summer days. SUP has gained popularity recently amongst locals and sport tourists as it's the perfect way to train or to soothe ache muscles from the surf. "We have quite a few stand up paddle surfers here on the island, so the scene is rather rich. In addition, increasing numbers of surfers and windsurfers are getting into paddling because they like the fitness aspect of SUP. "- Totalsup.com. 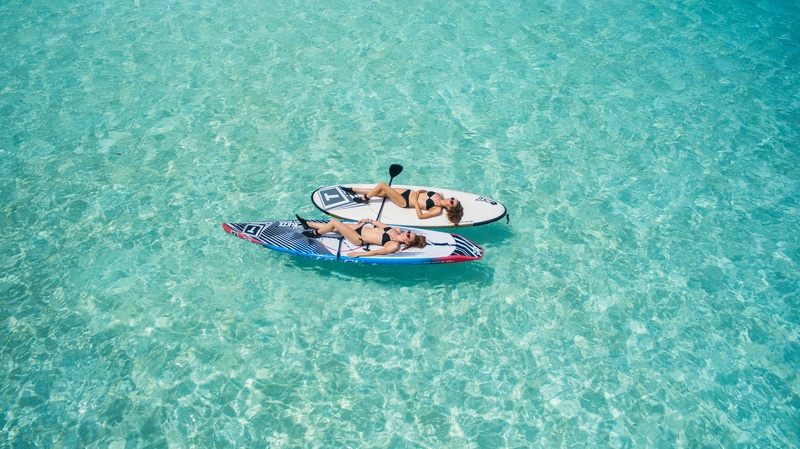 We have some uber cool packages available on the island, plus packages that incorporate yoga on SUP and other techniques. Click here to find out more. SUP is low impact, this means that if you are injured, feeling those aches and pains from other sports/workouts then taking some time on the water could be just what you need. SUP helps ease muscle fatigue, aid recovery and stretch you out. SUP is wonderful at building core stability strength and improving overall balance and agility. Keeping your core engaged and you move slowly through the paddle movements helps isolate the muscles, build the strength and improve posture as well. Simply the act of standing up, elongating your spine, feeling that energy in your core and standing strong as you try to balance you can change the way you hold yourself. When taking part in SUP is similar to running, aerobics, & even cross-training, helping improve your cardiovascular health and therefore reducing the risk of associated diseases. Plus, you cant put a price on physical exercise in general for keeping your heart healthy, no matter your age and taking nice deep breaths in the clean air and feeling the power go to your muscles. Simply reconnecting with nature has untold benefits for your overall health. There is something intrinsically balancing, helping you find some semblance of equilibrium when you are out on the water. Feeling the energy from the ocean, working with the waves and the movements of the sea to heighten your experience. There are a few different sports that we have experiences lend themselves well to an overall training regime that involves SUP. Snowboarding and skiing to name two, they require core strength and overall balance, this can be aided by paddle boarding. Plus, it makes sense, naturally that between surf sessions, you can still connect with the water and enjoy the health benefits of SUP. If you add some yoga to the equation, you can build muscle mass and tone to improve your inner and outer wellbeing. SUP, therefore should be explored as a training tool and a sport in its own right. Get out there, grab your board and paddle and try it out for yourself to reconnect with nature and taking the time to be in nature.